Riot squad cops had to move in to separate gangs of rampaging loyalists in the first violence associated with this year’s marching season. A senior police officer has said they recovered a crossbow and hammers during a night of violence in Carrickfergus. The trouble that broke out on the edge of the Castlemara estate is understood to be between UDA and UVF factions in the town where tensions have been high following a recent paramilitary attack when a man was shot in both legs. 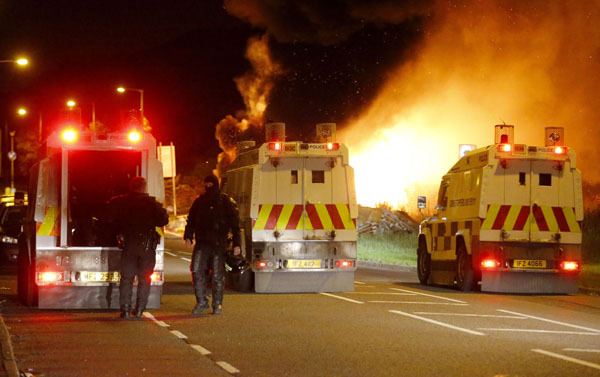 Violence broke out on Friday night (July 1) after one of the factions set fire to a rival bonfire. Carrickfergus is the powerbase of the South East Antrim UDA faction that broke away from the mainstream group in 2007. Superintendent Emma Bond said they had to deal with a serious incident involving a “large crowd”. Two men have been charged in connection with the trouble, a 36-year-old with causing a dangerous article to be on a road and a 46-year-old with riotous behaviour. Both will appear in Belfast Magistrates Court on July 28. The violence took place just hours after a major Somme commemoration involving the British army in Carrickfergus which saw 5,000 people turn out to take part. A large number of police continued to patrol the area over the weekend with the PSNI helicopter in airborne over the area throughout the weekend. East Antrim DUP MP Sammy Wilson said the rioters had “insulted the memory of those who lost their lives at the Somme.” He added that their behaviour was “a disgrace”.